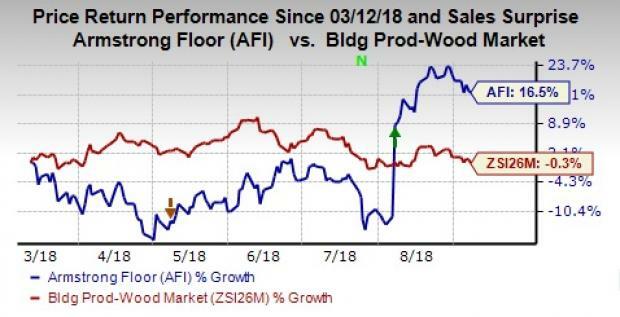 Armstrong Flooring, Inc.’s AFI shares have rallied 16.5% in the past six months against its industry’s 0.3% decline. Its price performance is backed by an impressive earnings history and robust second-quarter performance. Notably, Armstrong Flooring surpassed the Zacks Consensus Estimate in three of the trailing four quarters, with an average surprise of 29.2%. Recently, the company posted stellar second-quarter results, with both the top and bottom lines beating the Zacks Consensus Estimate by 4.4% and 80.8%, respectively. Moreover, earnings estimates for 2018 and 2019 have been revised upward by 79.2% and 24.5%, respectively, over the past 60 days. Let us delve deeper into the other factors that make this Zacks Rank #1 (Strong Buy) stock a profitable pick. You can see the complete list of today’s Zacks #1 Rank stocks here. Robust Volume Growth & Strong Pricing: In second-quarter 2018, Armstrong Flooring recorded substantial volume growth in Luxury Vinyl Tile or “LVT” business and strong pricing in most product categories, both contributing to 2.9% increase in the company’s quarterly net sales. Meanwhile, it has undertaken several pricing actions in the month of April and May, along with cost-saving strategies that drove adjusted EBITDA margins to 9.7%, reflecting an increase of 110 basis points year over year. Importantly, the company’s adjusted earnings grew 74.7% on a year-over-year basis to 47 cents per share in the second quarter, driven by higher sales, productivity and cost savings. It has several initiatives in place that are further expected to boost profitability. The company has also prioritized growth plans including LVT leadership, innovation, share of wallet with distributors, wood profit enhancements and revitalization of its legacy categories. These combined efforts are likely to lend Armstrong Flooring a competitive edge over peers and drive transformative growth that it had demonstrated in the first half of 2018. Solid Growth Prospects: Armstrong Flooring has solid growth prospects, as is evident from the Zacks Consensus Estimate for 2018 earnings of 43 cents per share, which is expected to grow 104.8% year over year. Moreover, its earnings are expected to increase 53.5% in 2019. Notably, the company has a three-five year expected EPS growth rate of 21.8%. Overall, it constitutes a great pick in terms of growth investment, supported by Growth Score of A. Innovation & New Product Introduction: Armstrong Flooring has been continuously focusing on innovation and new production introduction. In May, the company launched the Diamond 10 Technology on Vinyl Composition Tile or VCT, which has lower installation costs, along with enhanced scratch and stain resistance, leading to a lower cost of ownership. Additionally, it introduced new LVT product line that includes Prism, Alterna Planks, Rigid Core Elements and Vantage SPC Rigid Core. Collectively, both innovation and introduction are gaining strong market response, as well as driving revenues. Solid VGM Score: It has an impressive VGM Score of A. Our VGM Score identifies stocks that have the most attractive value, growth and momentum characteristics. In fact, our research shows that stocks with VGM Scores of A or B when combined with a Zacks Rank #1 or 2 offer solid investment choices. Other top-ranked stocks in the Zacks Wood Industry include Norbord Inc. OSB, PotlatchDeltic Corporation PCH and Trex Company, Inc. TREX, each sporting a Zacks Rank #1. Norbord has a VGM Score of A. Earnings for PotlatchDeltic are expected to increase 16.5% for the current year. Trex Company’s earnings for the current year are likely to increase 48.7%.